Indian forces killed these three teenagers in Kashmir! You do not need to fight a country whose people justify and enjoy the deaths of innocent boys and girls as young as 15! Their values are enough to destroy it. You just need to wait and watch! While giving an interview to Indian Media, DG Police Shesh Paul Vaid in Indian Held Kashmir (IHC) first time acknowledged the increasing murders of Kashmiris in the hands of Indian state terrorists. He disclosed that from January 2017 to June 2018, more than 106 Kashmiris were martyred in encounters. This does not include the number of Kashmiris that were shot dead during protests, those who were injured by shots of hunting shotguns termed as pellet guns by Indians and later on succumbed to injuries. He denied giving any details saying that he does not know. When he was asked that whether the Kashmiris killed in encounters were local or came across the Line of Control (LoC), because mostly after such fake encounters, Indian military commanders terms them as Pakistanis, DG Police did not reply. However, he gave the lollipop that next times his terrorist forces will try to minimize the number of death of locals by chalking out a plan about which he has no information right now. On 7 July 2018, while DG Police was talking with the media, news broke out that Indian army has martyred a female student “Angelie Andaleeb” of 8th class along with two others while more than 15 were injured in the Radwani village of District Kolgam. The other two were identified as Shakir Ahmed and Irshad Ahmed. 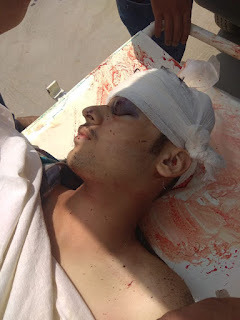 Hindutva republic of India & her 1 million terrorist military stationed in Kashmir 'murdered' 18-yr-old Kashmiri youth Tamsheel Khan in cold blood by firing live bullet on him. Indian soldiers did not allow the ambulance to evacuate the injured. Locals evacuated the injured to the hospital on their motorbikes by passing through narrow streets. Majority of the injured aged between 12 to 15 years. Indian media representatives asked DG police to verify the news but he went away without giving any answer. When media persons came out of the Sri Nagar Police Headquarters, the news the of martyrdom of 3 underage students in a village of District Kolgam had reached Sri Nagar and people had started protesting against it. The murder of innocents on every three to four days is a routine in IHC. The crime of the Kashmiris is that they do not accept the slavery of terrorist Hindu India. They want accession with Pakistan. India wants to enslave them through military and power. She had utilized all acts of war crimes against humanity that one may hardly imagine. Such terrorist use of military power has not been observed in any democratic country that state terrorists set handcarts of vendors on fire to show their anger because they failed to control the protests. On 10th July 2018, Indian terrorist army did this as well. Firing live bullets on unarmed protestors, use of shot guns in the name of pellet guns, baton charging, using under age protestors as human shields on the bonnets of military jeeps, crushing protestors under APCs and jeeps, all such shameful tactics are being used by Indian soldiers in IHC. On 10th July despite shelling and baton charging for the whole day when protestors did not stop, Indian state terrorists poured petrol on the handcarts and set them on fire. Vendors kept begging not to burn their handcarts, only source of their livelihood. Those who tried to through water on the burning handcarts were tortured. 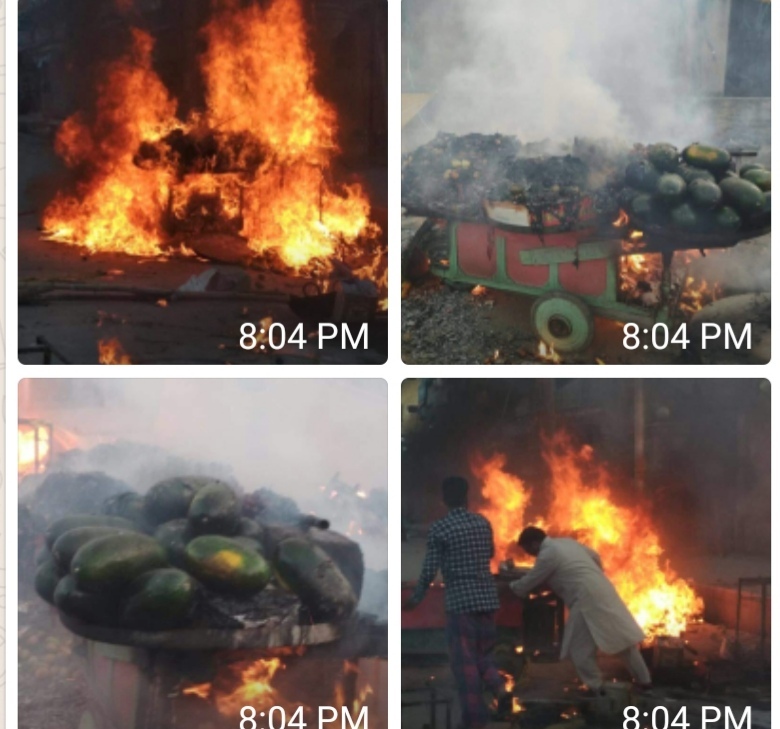 Indian soldiers might have looted the fruits of the vendors or wasted it but burning their only way of earning the livelihood was the worst show of hatred against Kashmiris by the Indian state terrorists. Few months ago, Indian state terrorists had started cutting the ponies (hairs) of Kashmiri female students. After strict protests from within India and condemnations of ambassadors of different countries in New Delhi this routine stopped. India should be ashamed of her inhuman acts and war crimes. India has been torturing Kashmiris for last seven decades for demanding freedom. 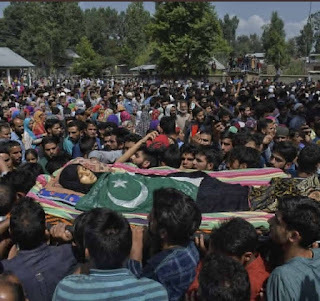 Whether it is the genocide of the Kashmiris, kidnapping them and torturing them to death in torture cells, dumping dead bodies in mass graves, gang rapes of Kashmiri women in Indian army’s barracks, looting and destroying properties of Kashmiris etc. India has utilized all war crimes and shameful acts but failed to crush the freedom movement. Now Indian state terrorists have started killing the children in IHC. 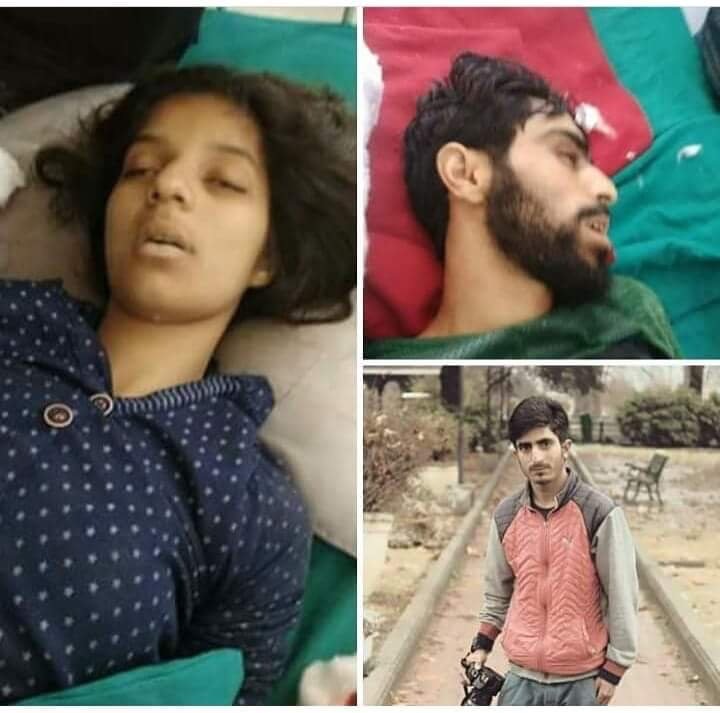 After every 2 or 4 days, 4-5 Kashmiri children are martyred by Indian soldiers. We overwhelmed by our internal political and problems cannot imagine the torture that a common Kashmiri has to bear on the daily basis. During the protest against Indian occupation forces Brutalities at Soura Anchar, Srinagar. Eyewitnesses said Indian forces set ablaze many handcarts of fruit vendors. Although we celebrate 19th July as Day of Accession of Kashmir but we forget that on 19th July 1947, Jammu and Kashmir Muslim Conference held at the home of the Sardar Muhammad Ibraheem led by the Chaudhary Hamid Ullah Khan in which Khawaja Ghulam Udin Wani and Abdul Raheem Wani along with 59 other notable leaders presented the resolution for the accession of Kashmir with Pakistan. Kashmiris are taking this resolution as a promise and sacrificing their lives for it since generations, even the war crimes and inhuman acts of Hindu terrorists cannot stop them from it. This was India who has gone to UNO and promised for the referendum so that Kashmiris may decide their fate and now India has stepped back from her promise.